40 year old. male with history of falling off a truck while doing some work had complained of low back pain, muscle spasm, hand and feet numbness, and neck pain since the time of the action. 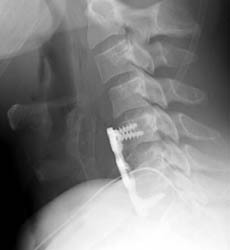 Patient underwent C5-6 and C6-7 anterior cervical discectomy with fusion using anterior plating. 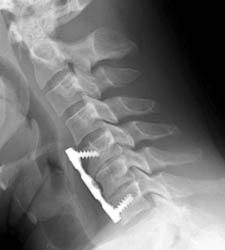 Lateral film showing the intact plate and screws for the fusion and nearly imperceptible grafting material in the disc spaces of C5-6 and C6-7. Lateral radiograph taken six weeks later on routine follow-up demonstrates loosening of the superior anterior screws and ventral displacement of the proximal anterior plate. Early incorporation of grafting material can be seen at the disc spaces.